This document contains links to all the resources you need to prepare for the IAR: Math--from logistics to released items. Take a tour through the resources available on Math Teachers in Action and take a deeper dive into some of our favorites. 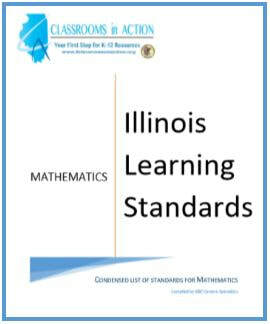 The Illinois Content Specialists compiled this condensed list of all the Illinois Learning Standards for Mathematics from Kindergarten through High School.. Print the whole document or just the grade level you need. Educators now have a 27 page alternative to the 93 page original. If you are looking to incorporate quality tech in your classroom, this is the place to start. The content specialists have vetted these tech tools and include a short review of the usefulness, strengths, and weaknesses of each. There are tools to help with standards aligned content, classroom management, family engagement/communication, social emotional learning, and more! The IOER is a collection of resources that has been compiled by Illinois educators in an effort to make quality , aligned resources more easily accessible. Educators can search the resources added by other users, add their own resources to share them with other educators, tag and review resources to make them more usable, and build sets and lists to organize their classroom materials. The IOER library will grow over time and the most used and highly reviewed resources will become more visible.